William Ward Mayhugh died November 18, 2017 after a short battle with cancer. Bill was at home in Ridgecrest, CA with family at his side. He was 90 years old. Bill was born August 8, 1927 to Lewis Harry Mayhugh and Ethel Euscebia Ward in Wheeling, West Virginia. Bill is survived by his wife, of 68 years, Dorothy Eileen Blose Mayhugh, Sons: Roy Mayhugh (Bonnie), Ridgecrest, CA, Robert Mayhugh (JoAnn), Bishop, CA, Richard Mayhugh, Inyokern, CA, Gary Mayhugh (Laura), Gardnerville, NV; 10 grandchildren, 25 great grandchildren and 6 great great grandchildren and a step-brother, Richard deBrauwere, Tualatin, Oregon. Bill is preceded in death by his parents, Lewis and Ethel, his step-father, Charles deBrauwere; his step-brother John deBrauwere and his son, Grant Mayhugh. In 1935, Bill and his parents moved from West Virginia to Burbank, CA. In 1943 he enlisted in the US Navy and served aboard the USS Tennessee. Following the battle of Iwo Jima, he transferred to the Destroyer USS Boyd, where he spent the rest of his enlistment. Bill was in the automobile and banking business. He moved his young family to Bishop, CA in 1957 and in 1960 he purchased the Volkswagen Dealership, Bishop Imports, Inc. Bill served on the Bishop City Council from 1968 to 1975 and served as Mayor from 1973 to 1975. In 1973, Bill became a partner of Murphy Motors in Ridgecrest. In 1976, Bill and Dorothy moved permanently to Ridgecrest. For many years Bill was a board member of First Federal Savings and Loan in Ridgecrest. 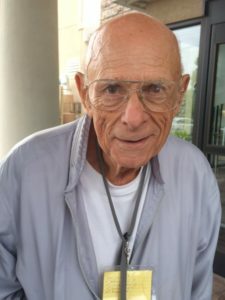 Bill was an active member of the Bishop and Ridgecrest Chambers of Commerce and a lifelong member of the Elks, the VFW, American Legion and other service organizations. A Memorial Service is planned for this Friday at 11 am at the Ridgecrest Elks club with interment the next day at 11 am at the East Line Street Cemetery in Bishop.